Sunday afternoon…….Friend’s birthday……..Need for fine dining…….Rumbling tummy…….RSVP here we are……..
Prawn Gyoza (Dumplings)…….Tasty prawn and veggie mix parceled in wrappers with soft sides and crunchy pan fried bottoms…..It was love at first bite. Chicken Pops…….I rename this “Extra-ness”. As if chicken tempura (battered deep-fried chicken pieces) isn’t indulgent enough, this one is tossed in sweet chilli sauce to make little but mighty fun bites. Prawn Tempura Skewers……Golden, crisp on the outside, meaty and juicy on the inside……what more could us food loving kids ask for? Mini Duck Rolls……spring rolls excite me and this wasn’t even one of regulars I’m used to, it was filled with super flavorful duck meat and that orange dipping sauce……pure delight. I had The Rabbit Lasagnette……truly exciting. I had imagined it to come all glued up in a baking dish but no, it arrived as a deconstructed stunner…….lasagna sheets interlaced with heavily sauced shredded rabbit, topped with rocket leaves for that fresh bite. Yes, I tried all my dining partner’s meals! Dining Partner 1, Abba had my favorite of the day……a simple meal of buttery mashed potatoes and juicy chicken that blew my tastebuds away! Sadly, I don’t remember the name but I’m definitely going back for it. Dining Partner 2, Nana had The Seafood Pappardelle. I love how homestyle this was……rich tomato sauce, fresh seafood and pasta, lots of cheese……couldn’t get any yummier. Dining Partner 3, Fawzie had The Chicken Katsu. The crust on that chicken was such a winner, I finished a whole piece! There was some dirty rice and fried plantains on the side but the chicken was all I needed to make me happy. Birthday girl had Crème Brûlée……oh Lordy, Lordy……perfect custard, perfect crust on top, perfect crunch with the biscuit, perfect browning of the banana slices…….everything perfect! Chocolate Fondant……By now, a lot of you know I’m not big on chocolate so I had to pass on this one. Strawberry Crumble…..RSVP makes lovely crumble! The crunch situation on this one was simply beautiful! 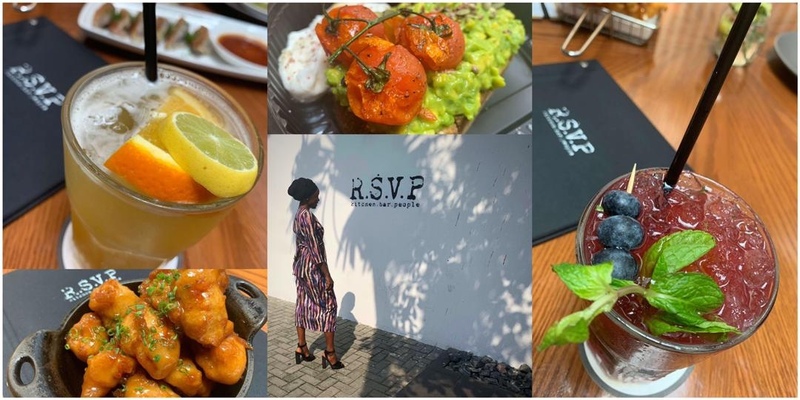 If you are one of those people who think high end restaurants are a waste of money because they only serve out only tiny-sized food, RSVP will change your mind…..their portions definitely fit the bill. Address: 9, Eletu Ogabi, Off Adeola Odeku, Victoria Island, Lagos.